Analysts discovered that this scheme ignores many opportunities for increased efficiency by supporting overlapping functions between the two groups. Data center infrastructure management (DCIM) combines the two groups into a single system. In OSI (Open Systems Interconnection) terms, the management of the physical layer 1 is included in the supervision of the remaining six layers for a “full stack” solution. Complete management systems include the ability to centralize monitoring, maintenance, and expansion activities. 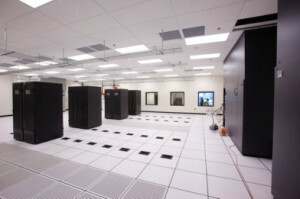 The components of a DCIM system include hardware, specialized software, and sensors. The hardware specifications remain the same as for a traditional implementation. The sensors provide a bridge between the hardware and software. These sensors convert physical information such as ambient temperature, humidity, and power supply integrity into digital signals suitable for a computer interface. DCIM software integrates traditional functionality with sensor monitoring capability, in order to allow the software to supervise the hardware. Many companies contract an industry expert to come into the firm, analyze the existing systems, and compile the business requirements. This exercise often concludes with a serious of seminars to educate management and the IT department. Armed with this knowledge, the company is ready to work with the contractor to choose the appropriate DCIM solution. Monitoring – the system monitors all electrical, mechanical, and power equipment, including servers, routers, switches, and virtual machines (VM). Two of these capabilities, capacity planning and cost containment, are examined in more depth. Step 1: Compile a complete inventory of the data center resources. Identify which are the critical infrastructure assets. List the mission interdependencies for each. Step 2: Generate a comprehensive monitoring report for each of the critical assets in the data center. Perform an analysis of the critical performance parameters. Use the analysis to identify bottlenecks in the system. Step 3: Ensure the DCIM solution will include data for all of the space, power, and cooling attributes of the environment. Verify that snapshot data is readily available to the supervisor in real-time, and that alarms are in place to indicate out-of-spec conditions. Step 4: Monitor daily workloads for a month or other suitable period. Make sure the system provides the flexibility to deal with on-demand needs as they arrive. Step 5: Validate system performance against service level agreements (SLAs). Step 6: Use DCIM trend analysis to complete capacity planning against future needs. These steps will provide the current state of the system, and allow scenario planning for future expected expansions. As part of a critical business analysis, companies use a DCIM system to provide the information necessary to generate an ROI (return on investment) on the data center performance. This ROI is based on a careful analysis of all cost contributors. Cost monitoring starts by analyzing the power and other resource consumption of all key assets from the capacity plan. It continues by monitoring dynamic use on a real-time basis. One of the strategies of cost containment is to avoid chasing up time. This pursuit can be a very expensive undertaking. Like many business processes, the cost sensitivity of up time tends to show decreasing returns on investment at high levels. Companies should perform a marginal cost analysis to find the optimal operating point. To perform a marginal analysis, the company can start by considering price points for each of a Tier-1, Tier-2, Tier-3, and Tier-4 solution. These points would be calculated for a fixed power budget (in megawatts) and an available data center floor space (in square feet). This will generate four cost values for each of the performance tiers. Then, the company should complete pro forma calculations of these values over a suitable period, perhaps 30 years. This will yield a marginal cost per year for each tier. These four values, as a ratio to marginal uptime for each tier, will yield the four values for marginal cost per hour of uptime. These values will climb exponentially as performance increases. This analysis presents a clear cost vs. benefits result to the company. Data center infrastructure management solutions offer powerful control to data center enterprises. DCIM allows demonstrable improvements in efficiency, performance, and cost control.